Pittsburghers know that the times are out of joint. Somehow they're expecting the prosperity to blow up in their faces. Mark Roth has a nice piece in the Sunday PG on what the Homestead Works was really like. It is an American thing to pretty much obliterate any traces of the past when redeveloping areas. To a degree, the Waterfront Development is lucky that it has the few artifacts that it has down there including the smokestacks and the gantry crane. Unless you work at the Edgar Thompson Works, the only way one can really experience what it is like to have worked in a steel plant is to head to Germany. There the nexus of industrial tourism in the world is in the German town of Duisburg, one of Pittsburgh's innumerable sister cities. Duisburg's Landscape Park has kept in place the nearly intact remains of the Thyssen Steel plant, which is another oversized integrated steel plant just like Homestead was. You can wander through the site from ground level to the top, inside and out. I have some pictures of the place. It really is amazing. Most of you know that they want to do something similar at the Carrie Furnace site. American insurance companies will prevent there from ever being the same kind of untfettered access at a US version of Landscape Park.. the place is one big tort waiting to happen. You can get away with that in Europe, but not here. I do see there are now some limited tours available to the public of the Carrie Furnace site though. busy or lazy I am not sure, but this is mooching off of the good people at the state data center. This is their map showing the percentage of workers using public transit users per municipality across the state. All that white represents municipalities where there is ZERO public transit ridership. The yellow is a little misleading.. Yellow represents public transit commuting of UNDER 1%, usually well under 1%.. so it might as well be white as well. Other than where you see red or the dark blue, you really have no public transit constituency to speak of. Thus you realize how hard it is to get support for things like dedicated transit funding in Harrisburg, or a regional transit agency between counties locally. We interrupt the normally meaningless ramblings here to muse on the soap opera otherwise known as 414 Grant st. The media reports would make it seem like the USS Caine down there. If there really is (or was I suppose) some titanic power struggle going on, a collision was inevitable. I would only suggest that the best advice for any situation requiring crisis communications is to get as much out there as you can up front. Otherwise the media will pick you apart digging until they eventually figure out all there is to know. Way too many questions left hanging to think this little episode is close to blowing over. Via articles in the Chicago Sun Times and then Governing.com, those who are working on getting a supermarket opened in the Hill District should make note of this research sponsored by Lasalle Bank in Chicago Stranded in the Food Desert - Reconnecting Communities with Healthy Food Options, which looks at the health consequences of minimal retail food outlets in low income neighborhoods. Huh? Is ameliorating congestion the main reason for public transit? I hate to point out the obvious, but both sides in that argument missed some real basic facts. I would peg the number of people living in households without a single car at 150K in Allegheny County alone. Those people will not be jumping into their cars to add to congestion becasue they don't have a car. There are also another 400K in households with just one car, of those who are in multi-worker households, you probably get a fair number of people using public transit during the day for one reason or another. How about the elderly who are significant users of public transit. Many of them have cars, but choose to use the bus becasue it's cheaper, easier or safer for them. No public transit means you will force many senior drivers who are currently doing the responsible thing and staying off the road and instead forcing them to drive. all that and I should have just said... Marie Antoinette had a similar idea. Worth a note is this article in the LA Times about some research commissioned by the Brookings Institution by George Galster at Wayne State University. Basically it does an analysis of income segregation across regions in the US. The story is of interest in LA becasue it is deemed to be the most segrgated large region in the country. It is of interest here because Pittsburgh comes out as one of the least segregated. Basically it says Pittsburgh has more 'neighborhoods' that are middle class, compared to other regions where people are more likely to live in separate communites: rich in rich neighborhoods, poor in poor neighborhoods. This may seem odd given what we know about Pittsburgh, probably becasue most data on spatial segregation focuses on racial segregation. This research is all about income segregation which is something different. Why would Pittsburgh have such a low level of income segregation. I say a big factor is just the low level of growth here. Cranberry and environs not withstanding, there has not been the rate of growth here comparable to most other regions. Without that growth you do not get as many of the new developments filled with McMansions which by defintion are going to be high income households. One factoid that supports this is that Pittsburgh's residential segregation by race has remained virtually unchanged over the last 25 years. Note also that this is all about the spatial pattern of income within a region, not about income distribution in general. One of the biggest changes in the Pittsburgh region in the last several decades has been how the overall income distribution has changed. If you look at wages going back into the 60's and 70's Pittsburgh had something extremely atypical in the US: a bimodal income distribution. Where most income distributions in the US have a big peak for the middle class, and a long tail in the upper income ranges, Pittsburgh's wage distribution had two peaks. I bet you can probably explain a lot of the dynamics within the region from the strange income distribution here. Over the last few decades one of the biggest transformations in the local labor force has been a convergence of the local wage distribution towards what is more typical across the country. Last week, Fester, who may be the illegitimate progenitor of this blog, pondered the meaning of a map I put up two weeks ago on where college students lived within the city. His comments lead one to wonder where young college graduates are, vice where the college students live. So this is what you get when you ask where college graduates (bachelors degree or higher) age 18-34 live within the city. Not all that different from the students per se, but different enough to ponder some more. Note that clicking on the image will give you a larger PDF version of same. Just when I thought there would be nothing to blog about today... The Onion gives us: PNC Park Threatens To Leave Pittsburgh Unless Better Team Is Built. Getting too serious here. Let's talk about.. mallow cups. Something (nostalgia? hunger?) convinced me to buy a Mallow Cup candy bar (made by local Boyer Candy of Altoona.. which gives it some blogability) the other day, something I had not done in an awfully long time. I remember that when I was a kid they had some green-stamp like marketing scheme where you collect stamps for money or something. Low and behold, they still seem to have this same plan, remarkably unchanged from decades ago. So here is what mallow money, as I call it, gets you. You get 5 'points' per candy bar. Once you collect 500 points (so 100 Candy bars??? ), you can mail them in and get a $1.00 dollar (the decimal place is in the right place) rebate sent to you. So let's see, 50-75 cents per candy bar these day = $50-75 in purchases. Net out 39 cents to mail these in and you have the potential to make out with 61 cents... maybe 1% if you are lucky. but wait, these 'mallow money' things are actually small strips of cardboard... 100 of which probably gets you well over the 1 oz you get to mail for 39 cents... easily pushing you to 2 or 3 ounces to mail, which the post office will charge you 63 and 81 cents respectively. If it weighs more than that, this may become a money losing exercise just to mail it in. There is actually a catalog of items one can use the mallow money for, I assume other than wanting $1.00 as cash. Online they have their rebate order form... The biggest item possible: for 8,500 points (1,700 candy bars... can you believe it) you yourself can have a Marty Mallow Quartz Watch. I don't think I will ever get the watch. I would say the rebate program needs a little updating. The $1.00 back is probably unchanged from when your average candy bar cost a dime. It is possible that given the troubled financial history of the firm, that they are just using up old stock of these cardboard backers. Maybe when they run out they will print up a new offer. In Belgium last month I did buy a few of what I am pretty sure are the worlds most expensive marshmallows at the Peter Macolini Chocolate shop... I think each mashmallow came out to be a dollar once you accounted for the exchange rate. Go figure. So I am still Mike Madison's proxy over on PITTSBLOG for a little while longer. I think I exhausted my local transportation musings over there by poking the beehive in a post about the North Shore Connector . So looking beyond Pittsburgh: here is a recent news article from St. Paul/Minneapolis on the lack of funding for personal rapid transit (PRT) technology. I was surprised to see that there were still PRT advocates out there to be honest. In many ways Pittsburgh's own Skybus is the grandfather of the PRT technology. It didn't get built here, other than the test run in South Park of course, but there are a few places where it did get built in some form. Not far away, West Virginia University still runs a campus PRT system. While I know there is nothing similar about the technology involved.. but thinking of PRT technology makes me wonder what is up with any of the media musings over the last year(such as this in the CP, Trib or PBT) I have seen over the possibility of a Zipcar franchise starting in town. Anyone know the status on that: up? down? someday? never? Maybe I just have been oblivious to this in the past, but I just noticed the Pittsburgh marketing video that is being played on two large LCDs screens at the airside of the people-mover at the airport. Seems like I have seen the content before, but honestly I can't remember seeing these screens in the past. Have I been that out of it or is this something installed for the all star game? The video has a lot of flyovers of the region interspersed with some text quotes from who you would expect to be commenting.. Although the quotee's would imply to me this was put together at least a little while ago. I think I mentioned in comments, but my one suggestion over the years has been to have a bunch of billboards along I70 between PA and MD, with some comparative info about Pittsburgh and DC. Maybe like a Burma Shave series, one with some job info, another with what some comparative housing prices are in the two regions... who knows what else. But Washington DC is probably the metro region with the most ex-Pittsburghers living there and a whole bunch must make that drive here and back every year. So you can target those ex-Pittsburghers pretty well at what may not be a big cost. Yeah, I know I have made these available already.. but it's one of those days without 5 minutes for something new. Again mostly documenting the obvious, but still interesting. A former Pennzoil plant north of Pittsburgh is slated to become one of the largest refiners of biodiesel later this year. 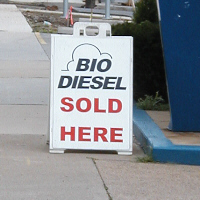 Biodiesel magazine also lists 65 other plants to open across the country. So the question becomes, where will you buy this stuff. Most days I pass what appears to be the only commerical source of biodiesel in the city on Baum Blvd in Oakland (see picture). Is this new supply coming online reflective of some unmet demand pushing up prices and inducing more suppliers into the market? Hard to tell since there is no price advertised by this dealer. If there really is some vast expansion in biodiesel supply coming, wouldn't there have to be more outlets to supply this fuel. Will there be separate biodiesel pumps at retail stations? Just seems strange that if the spigot is being turned on imminently, the rest of the supply chain needs a little ramping up. After I thought of this I saw that Mark S. had already written on the state of biodiesel in the city a couple years ago. I hear he may have an update to that as well coming soon. If there are more outlets, he will have to do a full map/mash up so people know where to go to find them. Update July 2007.. For those arriving . See the later post on the new biodiesel option in Oakland. So, this is a little off the reservation in that it's not a local story at all. But it seems to me that the media touches on, but does not really give that much notice of an important factoid that came out today. Average gasoline demand in the US was just over 9.5 million barrels per day (mbd) for June. That rate turns out to be the single highest monthly average ever recorded. (fyi: here is the data) The last few individual weeks have even been higher at over 9.6 mbd. So despite record high gasoline prices the decline in impact on actual gasoline consumption is minimal. There is population growth in the US that needs to be accounted for but even so.. these numbers give you a fairly low elasticity between gasoline prices (up a lot) and actual demand (steady if not increasing). If one were to read today's headlines a year or two ago.. things like "oil down to $74 a barrel" would have been unthinkable, even to the point of inducing panic, but it seems we have gotten used to this. BTW: a barrel is 42 gallons.. so it comes out to ~400 million gallons a day, or somewhat under 1.9 gallons for each adult age 20 and over per day. Anyway... not much curve in that demand curve it seems. I am kind of wondering if gasoline is a mythical Giffen good? but I am probably nuts. .. maybe we will make this a weekly motif... we will see. I thought the photo would be just a tad bit harder to figure out. The photo contest was indeed PAT's commuter rail line, or PATrain, which ran from the Mon Valley into Downtown. I even went to the trouble of smudging out the PATransit label that appeared on the front and the side of the engine. The answer came quickly from Jim Russell/Globalburg (who has a blog on the Burgh Diaspora) and a postcard to him is in the mail already. I actually have a few of these postcards, if someone really wants one pop me an email. Someone ought to have a comprehensive PATrain web site, but I don't know what it is. 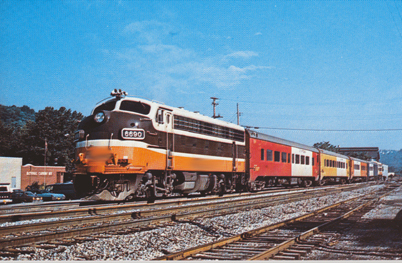 Potter at CP has some information on the history of commuter rail in the county. PATrain was not alone. It is just a coincidence, but tomorrow (July 12th) is the 21st anniversary of the last ride of the Pennsylvania and Lake Erie (P&LE) commuter rail line from Station Square to Beaver Falls. and you may want to keep up on Bike Pittsburgh's Blog which has a note there about a meeting with Dan Onorato on Thursday where he will be briefing Young Voters and the general public on his Transportation improvement plan. See their blog for more info on place and time. It is sad to note the Mayor's sudden illness. I have never heard anyone dispute that with Bob O'Connor what you see is indeed what you get, a remarkable feat for any public figure these days. I suspect that even those who have not supported him politically in the past do not doubt that he is someone who believes in Pittsburgh and is beyond that an eminently good guy. I honestly do not have any inordinate interaction with the Mayor. In fact, the most common place I would even see him over the years has been rushing to get into the last Catholic mass in the city each weekend which is at Sacred Heart in Shadyside at 7:45pm on Sunday. Probably like me he is often just making up for missing an earlier mass. He does not show up with any fanfare nor seeking any notice at all as best I can tell. One can sense he has some of that humbleness that we are taught we all should have.. and that seems hard for politicans to retain once in office. I am sure many will be praying for him in coming days. Just an informal photo-contest: Anyone know what this is a picture of? I have muddled the image just a bit in photoshop in order to keep it from being too easy a question. The prize? Whoever is the first to post in comments the correct answer can have the postcard this image comes from. If you want to remain anonymous or pseudonymous online just send me an email (cbriem@pitt.edu) with the same time-stamp as your comment. This is mostly documenting the obvious.. but still worth a look: Where college students (undergraduate and graduate) live within the city. Not much concentration outside of the city to show.... even pretty concentrated within the city. This really isn't meant to pick on Giant Eagle.. but someone pointed out to me that they felt the bird's gas discount program was unfair to those who drive small cars. I am not trying to be an advertisement for anyone, I think most know about the FuelPerks program where you get a variable number cents off per gallon based on how much food one buys at the chain. The discount one gets is for a single purchase at the pump. Thus no matter how many gallons you purchase, you use up the discount 'earned' via food purchases to date. You obviously get a lot bigger discount if you put 30 gallons into a Hummer than 10 gallons into a Prius (it was a prius owner who pointed this out to me). So without getting into the philosophical debate over whether any market prices are fair or just efficient, it's a little curious. Normally, supermarkets work to give less affluent customers lower prices. The availability of 'generic' brands or coupons are classic examples of price discrimination or so we teach. Those who need lower prices and are willing to clip coupons can buy products at lower prices while higher prices can be extractred from those who are not as price sensitive. From a profit-maximizing perspective it makes perfect sense. So why does this gas discount seem to work in the opposite direction. Sounds to me less like price discrimination but some targeted marketing. The large minivan or SUV driving family is likely to have more food purchases, let alone more higher margin products, than a lot of urban and small-car-owning customers. So it makes a lot of sense for a marketing campaign to target the large gas tank market. Short of buying the list of Lincoln Navigator owners, this may be the holy grail of marketing even... I am surprised nobody has really implemented such a scheme before. It also makes me think they like the way this works and despite whatever protests their are, I suspect the program will remain as it is. Just an observation. Catching up on news from last weekend. While I realize journalists must report what they are told to a degree, I do quibble with this trib story that describes the city's bond refinancing completed a few months ago as somehow freeing up $50 million. I am actually sympathetic to the argument that the city was forced to take on even more debt to pay for the minimal level of capital spending essential to keep the streets and bridges from crumbling... it is nontheless false to describe the recent bond financing as one that "freed up" much of anything. The $50 mil that is earmarked for capital spending was almost entirely net new borrowing, the refinancing at best saved $3 million or so after expenses of $3 mil. For anyone who has completed Financial Accounting 101, well maybe 102 for this deal, a homework assignment could be to work out the pricing of the city's recent bond refinancing to figure out where exactly the reported net savings comes from. Here is the bond's final official statement which has most of the details needed for the calculation. It is an amazingly complicated deal. By my count, this little transaction jiggered with no less than 10 other outstanding bonds. but the city's debt is the nexus of the region's fundamental problem: when you couple the growing debt of the city, mostly accumulated decades ago, with the declining population of the city, you get a big disconnect between who benefited from past deficit spending and who is being expected to pay.. If the city's population decline continues, or even if it just stays the same, why would anyone want to move into the city just to pay off the debt incurred by those who are no longer here. In another post I will explain a very astute argument made to me that goes like this: it could be that the city's relatively depressed housing prices are in fact a reflection of the city's accumulated debt capitialized into real estate values. In a sense this means the housing is not really that cheap, but you actually buy a cheap house coupled with a latent debt load that will eventually have to be taxed from the homeowner. Whether that is feasible and what it says about the housing market being super-efficient is a topic too deep for this post. I really dont think anyone cares about how I spent the weekend.. but the long weekend included biking around Ohiopyle. 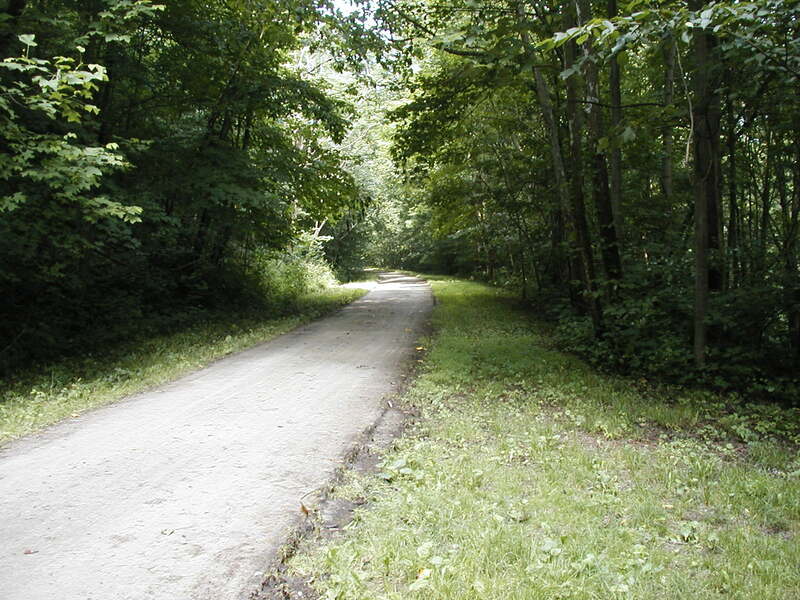 I feel obliged to mention this study from a few years ago done at UCSUR on the Survey and Economic Impact of the Allegheny Trail Alliance... (that links brings up the executive summary. For the full table of contents click here)... and this study was all done before the work on the Big Savage Tunnel which finished the major work linking Pittsburgh to Washington DC which will clearly increase usage of the trail. It may not be a rock-climbing wall on Mt. Washington, but it's fair to say the Great Allegheny Passage is pretty unique amenity here. It's not football season yet, so I am allowed to at least mention Cleveland without an accompanying epithet. There are a few interesting articles over the weekend up there that really are relevant here. The Cleveland Plain Dealer has an article on Northeast Ohio's First Suburbs Consortium, an organization up there that is focused on development in Cleveland's inner suburbs. We have the same issues here so it's worth a read. Also on Friday there was this article about a panel discussion where Thomas Bier, director of the Center for Housing Research & Policy at Cleveland State University's Maxine Goodman Levin College of Urban Affairs said that Cleveland "needs to build 2,000 to 3,000 units of housing a year over the next 50 years to stem the tide of an outmigration that has been going on for decades and to rebuild its income tax base." Now Cleveland proper is a little bigger than Pittsburgh.. but 2-3K units of housing per year is a lot. How are we doing in comparison? Building permits for new privately owned residental housing units in the City of Pittsburgh average in the low hundreds in recent years. This work by Christopher Briem is licensed under a Creative Commons Attribution 3.0 United States License. Your less than random . Did you know the G20 came to Pittsburgh? Unemployment in Pittsburgh... high or low? Whither the single family home (in Pittsburgh)? Is the City of Pittsburgh growing? Or not? This work by Chris Briem is licensed under a Creative Commons Attribution 3.0 United States License.